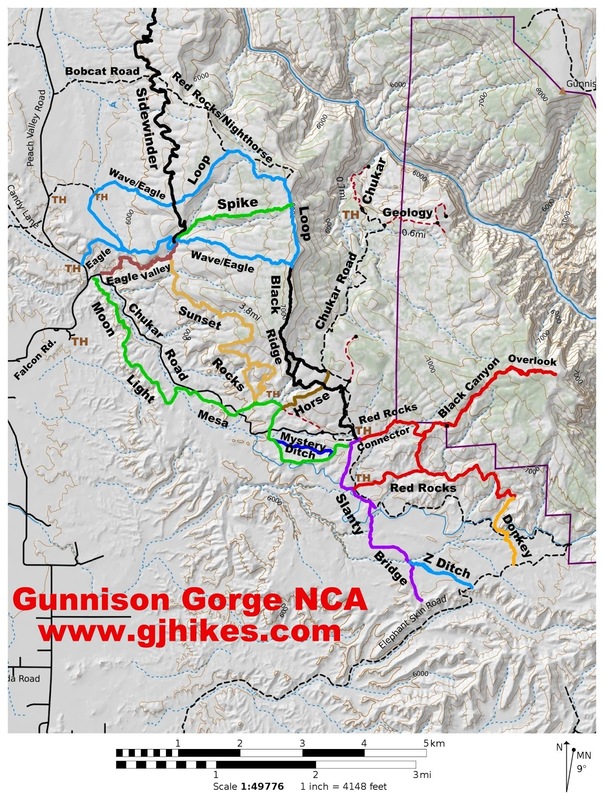 The Horse trail is located in the Gunnison Gorge National Recreation Area and Wilderness near Delta, Colorado. The trail begins off of the Chukar Road at an intersection with the Black Ridge Connector trail. From there it travels through the pinon and juniper forest that covers that area to the point where it makes a dramatic descent down the mountain losing over 400 feet of elevation before coming to an end in the valley below at a junction with the Moonlight Mesa trail. For this post we mountain biked the Horse trail in the downhill direction beginning where it starts off of the Chukar Road. To get there we parked at the Elephant Skin Staging Area which is 1 mile away and road up the road from there. From the Chukar Road the trail begins a gradual descent along a small drainage. The trail has a lot of loose rocks like most of the trails in this area. Within a few tenths of a mile the Horse trail crosses the Black Ridge trail near a large spillover. 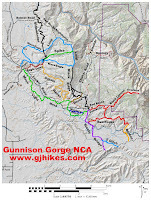 A nice hiking option is to park where the trail starts off of the Chukar Road and make a loop out of the Horse, Black Ridge and Black Ridge Connector trails. There are a couple of very scenic options there for loops that are up to a mile and a half or so in length. After crossing Black Ridge the trail does some easy climbing that leads up to a mesa where it joins an access road that comes in on the left. The trail leaves the road at the edge of the mesa and begins descending the west side of the ridge. At first the rounded shoulder of the mountain and the way the trail is routed keeps the descent from getting too steep. All that changes as the trail gets both steeper and more rocky. The final plunge that the trail makes into the valley below eventually comes into view. We had studied this section of the trail from below on several occasions when hiking and riding the Moon Light and Sunset Rocks trails and decided then that the funnest option for us would be to mountain bike off the ridge. Near the bottom of the hill the trail smooths out as the ground transitions to adobe clay. The Horse trail meets up with the Moonlight Mesa trail at that point and comes to an end. From here the Sunset Rocks trailhead is withing a hundred yards or so to the right. On this trip we followed the Moonlight Mesa trail to the left and after crossing the Chukar Road we got onto the Mystery Ditch trail and made our way back to the Elephant Skin Road where we had started. We ended up making a nice 3.2 mile loop out of the Horse trail. If you would like to see it for yourself then all you have to do is 'Take a hike'.